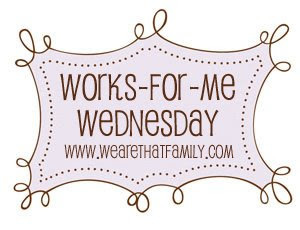 It's Wednesday once again and over at We are THAT Family, you'll find Works for me Wednesday. Muffins - These can be baked on the weekend and either kept in the freezer or in the refrigerator so they can have one during the week without the hassle of baking. Oatmeal - I've stopped buying the "Instant" Oatmeal packets. We were only getting the regular flavor anyway (they didn't like the flavored ones). And they were often eating more than one pack a morning anyway. So I've been buying a big container of Quick Oats and just making them the same way I did the "Instant" ones. I like a little more flavor to mine, so I often add something to it (chocolate chips, cinnamon chips, raisins, etc). Pancakes - Same as for waffles, except I usually make them a little on the small side and microwave them instead of toasting them. Eggs - I take two eggs, scramble them (sometimes with a little milk or water), microwave them in a bowl for 30 seconds, stir then put them in for another 30 seconds. You can add cheese too for the last 30 seconds. Hopefully you'll get some ideas from this. Next I want to try to find an alternative to frozen "French Toast Sticks" which really aren't much like french toast, but my kids love them. I want to try to find a way to make them myself. For more ideas and tips head over to We Are that Family (click the image above). 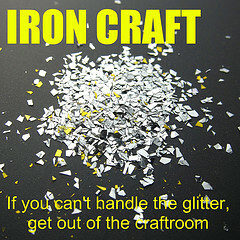 If you like to do crafts, check out my Craft it Forward, there are still a few spots available. I like to make an easy egg sandwich - similar to the way you make your eggs in the microwave. Beat one egg and pour into a greased breakfast bowl. Microwave for 30 seconds, then top with a slice of cheese and cook for 20 seconds more. Meanwhile, toast 2 slices of bread, a bagel, or an English muffin. Slide the egg onto your choice of bread. I do many of the same things for breakfast. I also make egg strata the night before and put it in the oven when I first wake.